Even the label design is nice. Look at that. So stylish. Such charming bottle copy. Sometimes you’ve gotta get back to basics. As happy as I am that there’s such a diverse variety of cider flavors out there, it’s also good to have a healthy population of just…regular old hard apple cider. 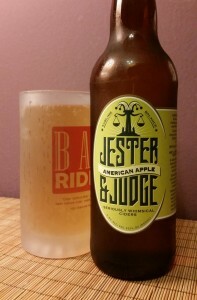 Jester & Judge’s American Apple is exactly that. Coming in at 5.8% ABV, it has a slight fresh aroma of apples and pours a clear golden amber. The flavor is a careful, perfect balance between sweet and dry, between too much flavor and a hollow lack of it, between too much acidity and too little. Seriously, it’s Goldilocks the apple cider. I love it. If there’s anything to criticize about it, it’s that it’s pretty flat — I’d have liked it to be a little fizzier. But that’s hardly the kind of thing to keep me from drinking a cider, and not only have I gone back to my local QFC for it repeatedly, I’ve recommended it to others as a really solid cider. Jester & Judge’s website is sparse — I guess they’re still pretty new — but when I saw they have an image of a “Marion Perry” label I clapped my hands to my face and gasped in delight. That sounds amazing and I’m excited for it. No idea where you can find Jester & Judge other than at QFC in Seattle, but I definitely recommend looking for it. This entry was posted in Cider and tagged 650mL, american apple, jester & judge. Bookmark the permalink.